‘ Oh please, oh please, we beg, we pray, go throw your TV set away, and in its place you can install, a lovely bookshelf on wall.’ – Roald Dahl. Ok, so we have to compromise, and we do have a TV, but books are a massive part of the boy’s childhood. I’ve always been passionate about finding beautiful books, with elements of design which marry with entertaining and spell binding content. I was brought up with some beautiful books which I still treasure, and I wanted my children to also learn the joy of reading, listening, and allowing their imagination to take them to magical places. Fortunately we stumbled across Smallprint books through Instagram. I’m a fierce advocate of ‘Make it a rule never to give a child a book you would not read yourself’ – George Bernard Shaw. 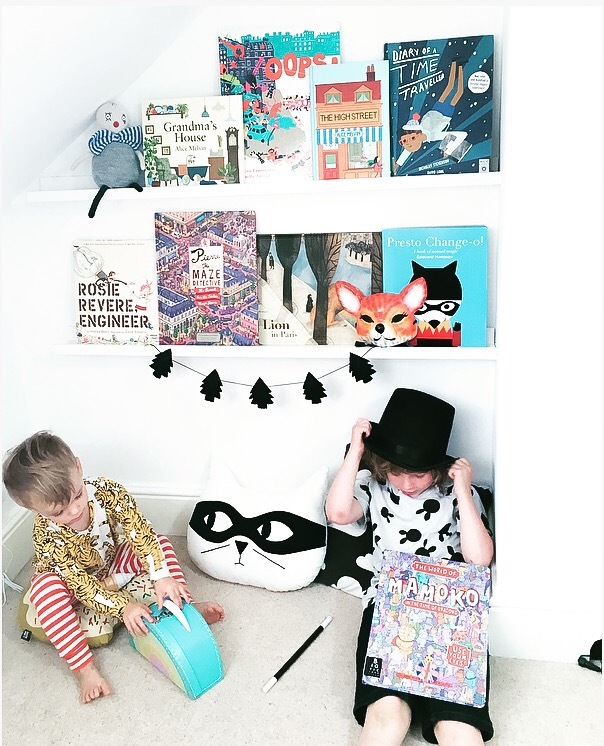 As we believe fiercely in marrying great design with delighting children, Smallprint Books has exactly the same ethos. The website is easy to navigate, and we found the age appropriate sections particularly helpful. Each of the titles on our bookshelves can be found at smallprint books. Books are easy to chose based on clear pictures and descriptions and one of our first (and most treasured books by Felix) was Pierre and the Maze Detective by Hiro Kamigaki + IC4Design. The book features 15 full spread intricate illustrations of intricate, magical mazes. It keeps Felix fascinated for ages and he loves discovering things when he sits and reads it with his dad. We love it so much that we’ve also bought it as a gift for one of our friends. Smallprint (very convieniently) offer a gift wrap service which made it easy as we were on holiday when I needed a present fix! 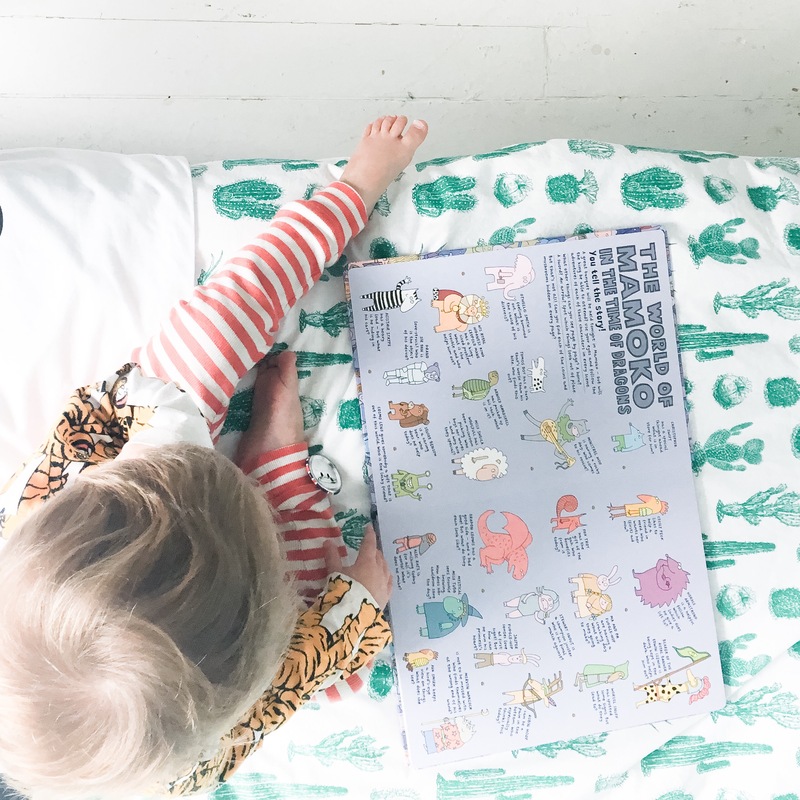 Recently, we ordered a couple of new books and were sent Mamoko which is a different concept for a kids book- which has gone down an absolute storm. Mamoko is a book without words, where the reader (generally my five year old) becomes the story teller. At the beginning of the book, there is a description of all the characters which can be spotted and followed on each page, each doing funny or nutty things. Felix absolutely loves choosing a character to follow and making up his own version of what they are up to. 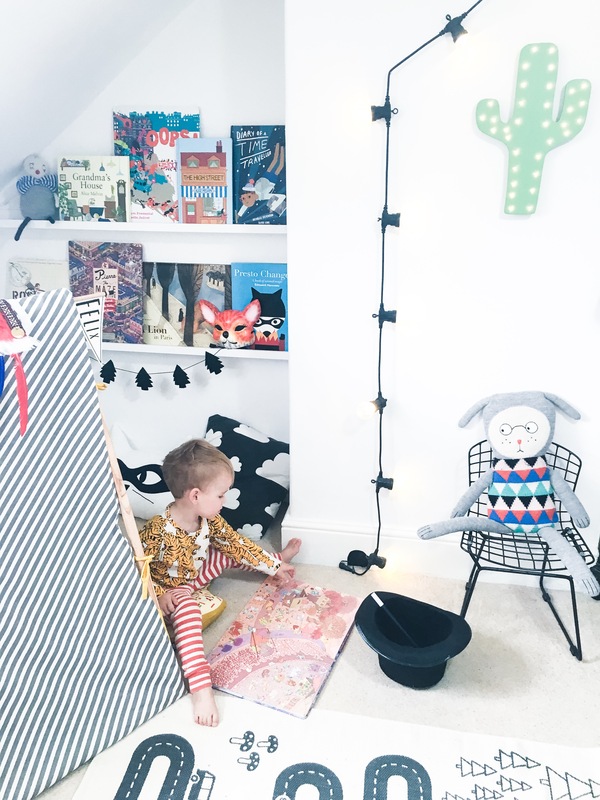 As a parent I love hearing his stories and seeing how absorbed he is when he’s looking at the beautiful and bright illustrations. It’s a hit with my husband too and they both enjoy looking at it together and choosing their favourite character to follow (there’s a whole page full so always someone or something new to follow or find). It’s even popular with my two year old who loves flicking through the thick pages and looking at all the illustrations! 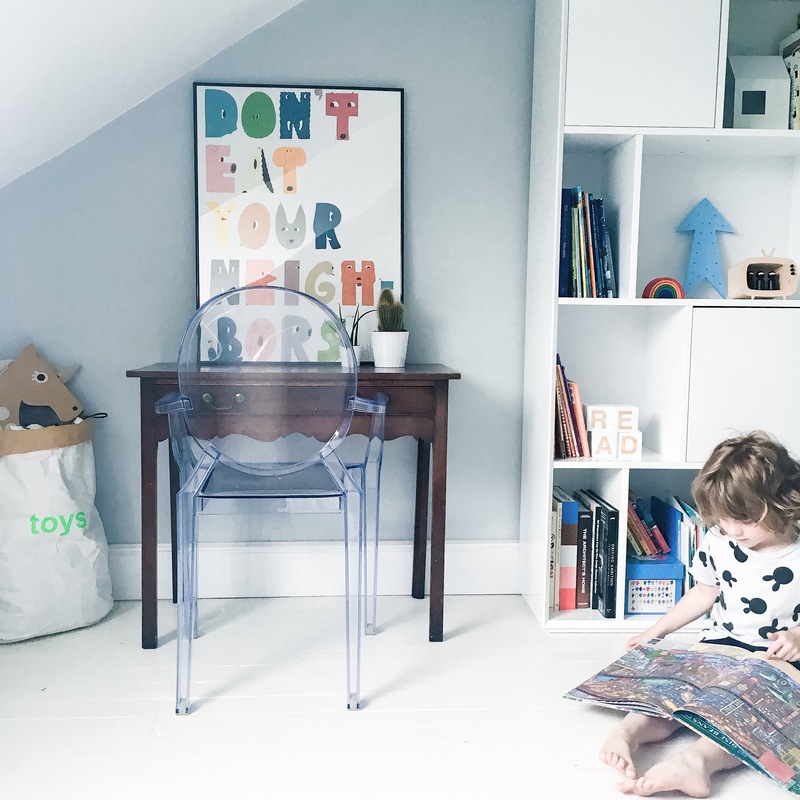 All of the books you see on our white shelves in the boy’s room are available from Smallprint online and there’s a 10% discount when you sign up for their newsletter. 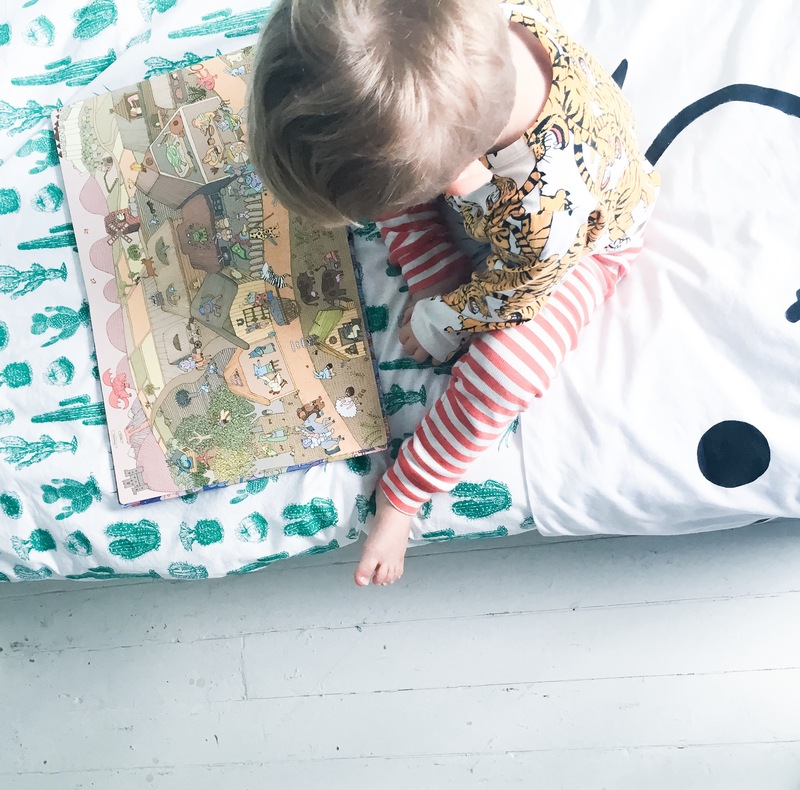 Visit smallprint-online.com to take a look and discover some magical books your children (and you) won’t want to put down.